Choose your instruments from the "Panel Setting" drop-down menu. Drag aircraft on map to change the aircraft's position in relation to the facility. If North Up is selected aircraft heading changes can be set by positioning the cursor close to the aircraft on the map then clicking the button when a "-" or "+" appears. If Heading Up is selected, aircraft heading changes can be set by positioning the cursor close to the navigational facility on the map then clicking the button when a "-" or "+" appears. 2. Holding Shift key down and moving the cursor near the aircraft center will display a blue arrow extending from the center of the aircraft with the current direction of the arrow from the aircraft in degrees displayed on the line. While holding the Shift key down and moving the mouse cursor around the map, the arrow radiating from the aircraft will follow the mouse constantly showing the direction from the aircraft. Clicking the mouse button will change the aircraft heading to the current direction of the blue line. Release the Shift button to hide the blue line. IMPORTANT KEYBOARD CONTROL NOTE: The simulator start button must be pressed and the aircraft rotating-around-the-globe icon (Fig. 2) must be moving for the keyboard commands to work. In addition, if clicking outside the simulator (like clicking on the browser scroll bar, text or any other area outside) the browser may stop sending the keyboard commands to the simulator. You must click on any blank portion of the simulator to allow the browser to transfer keyboard commands to it. You can also still drag and reposition the aircraft even if it is moving. Displays the horizontal position of the aircraft in relation to the navigational facility the same way an IFR en route chart or an approach plate's plan view would. Area where indicated airspeed, and bank angle. These are directly controlled by the keyboard commands. Location for other instruments such as DME, flight time, and chronometer. The start / pause button controls when movement begins or pauses. Flight time and chronometer stop when aircraft motion stops. Aircraft circulating icon reinforces if aircraft is moving and what rate is the simulation speed. This control can also be activated through the keyboard shortcut ”P”. Represents the Navigational Aid selected and is similar to the representation found on aeronautical charts. Shows on the Horizontal Navigation panel the region where the VOR / HSI flag will display From if the aircraft is positioned in the From region regardless of heading. Shows on the Horizontal Navigation panel the region where the VOR / HSI flag will display To if the aircraft is positioned in the To region regardless of heading. Shows the vectors that make up the wind triangle. It shows the green (heading and true airspeed) plus the blue (wind direction and wind speed) resulting in the orange (course and ground speed) vectors. A brown line showing the radial that the aircraft is on in relation to the navaid. Used as an aid to show the orientation of the Horizontal Navigation panel. It serves the same purpose as the compass rose symbol on IFR en route charts to show direction in relation to the magnetic north. Similar to the compass rose in that it is used to indicate the direction of the magnetic North. In this case it is the symbol on the NDB (navaid 3). Shows a line passing through the navaid in the direction of the course that is set in the instrument and another line that is reciprocal to that course. Line passing through the NDB (navaid 3) and the aircraft showing the bearing that the aircraft is in relation to that navaid. Displays the width of the horizontal panel map in nautical miles. The holding pattern template is available to assist entry and execution of the holding patterns. Labels with inbound course and sectors are also displayed in this template. The ability to display on the map intercept angle, angle in relation to course, and angle in relation to radial has been added. This can be found under Other Settings, Auxiliary/Reference Marks. Show Triangle: selects whether the wind triangle will be visible on the map. Show Arrow: if show triangle is selected, this option will place arrows on the wind triangle vectors. Size: sets the size of the wind triangle displayed on the map. Spd: sets the value of the wind speed. Dir: sets the value for the direction from where the wind is coming. Trace On: when enabled, the path that the aircraft is taking will be recorded in memory. Please note that if you have a slower computer this might cause the simulator to significantly lose performance. Show Trace: if the path of the aircraft was recorded or is being recorded through the “Trace On” option, a line will be drawn through the points that the aircraft traveled on the map. Max Zoom In: selects the maximum zoom in scale. Sim Speed: this option selects the timescale for the simulator. For example if 2x is selected time will pass twice as fast and the aircraft will appear to move twice as fast. Max Bank: this selects the maximum banking limit when using the keyboard commands to bank. The default “Std Rate” automatically limits the bank to standard rate based on the aircraft’s current speed. North Up: if selected, the map orientation will be north facing up. When deselected, the map orientation will be the aircraft’s heading facing up. Note that when “North Up” is NOT SELECTED additional computer processor performance will be necessary to keep moving the map as the aircraft heading changes. This can reduce the simulator’s performance. If you see that the simulator’s performance is slow it is best to keep the “North Up” option selected. Show Map: when deselected, hides all of the features on the map. Use this mode to navigate on instruments alone and test your navigation skills. Show Aircraft: when deselected, hides the aircraft icon on the map, along with aircraft specific map features. Load: retrieves all the settings and aircraft position from a memory slot. Save: stores all the settings and aircraft position in a temporary memory slot. Default: restores all default settings and default aircraft position. Clr All: clears all the temporary memory slots. Show Compass Rose: selects if a compass rose will be displayed on the map and whether it will be displayed large or small. Show Aircraft Radial: selects whether a line drawn from the navaid through the aircraft, showing the aircraft’s radial in relation to that navaid, is displayed. Show Magnetic North: selects if a Magnetic North symbol will be displayed on the map on the navaid. Show Aircraft Bearing: selects whether a line drawn from the navaid through the aircraft, showing the aircraft’s bearing to that navaid, is displayed. Radials/Bearings: selects whether text displaying the radial or bearing will be shown on the map when the Show Aircraft Radial or Show Bearing is selected. OBS CRS: selects whether a text displaying the value of the OBS setting will be shown on the appropriate navaid when the OBS CRS To/Fr option is selected. Show To/from: selects whether the to and from area of the navaid tuned to NAV 1 will be shaded and displayed on the map. Show OBS CRS To/Fr: when NAV 1 is tuned to a navaid, this option selects whether a line will be drawn through the navaid showing the OBS CRS to and from that navaid. Show To/from: selects whether the to and from area of the navaid tuned to NAV 2 will be shaded and displayed on the map. Show Template: selects whether or not the “Holding Pattern Template” will be visible on the map. Non Standard (left turns): if enabled, the holding template will be shown for left turn holding patterns. If disabled, the standard right holding pattern turns will be depicted. Relative to: selects if the holding pattern template will be relative to a particular navaid or intersection. Inbound Course: the course in degrees for the holding pattern’s inbound course. Sector Direction Labels: shows labels in degrees both outbound and inbound for each sector. Sector Division Lines: draws the line at the division of each sector. Inbound CRS: draws a line and arrow in the direction of the inbound course. Course Abeam Lines: draws two lines abeam the inbound course. Holding Symbol: shows a race track pattern symbol that depicts the direction of turns for the holding pattern. Note that this symbol is not drawn to scale and should only be used to determine the direction of turns for the holding pattern. Show Reference Line: selects whether or not the Reference Line will be visible on the map. Relative to: selects if the reference line template will be relative to a particular navaid or intersection. Ref Line Course: selects the direction that the reference line will be drawn. “Recip” button changes that value in 180°. Ref on Outbound Course: selects if the line will be drawn from, or outbound of, the reference point. Ref on Inbound Course: selects if the line will be drawn to, or inbound of, the reference point. Ref on Both: selects whether the line will be drawn both inbound and outbound of the reference point. Show Ref Line Labels: if selected displays labels for the direction in degrees of the course of the reference line. Relative to Heading: draws a line from the aircraft in the direction of its heading. If that line intersects the reference line an angle symbol and a label displaying the relative angle in degrees between the two lines will be displayed. Relative to Acft Track: draws a line from the aircraft in the direction of its track. If that line intersects the reference line an angle symbol and a label displaying the relative angle in degrees between the two lines will be displayed. Relative to Rad: draws a line from the Navaid to the aircraft and displays an angle between that line and the reference line. Additionally a label showing the value for the radial in degrees relative to the aircraft position is drawn. Relative to Brg: draws a line from the aircraft to the Navaid and display the angle between that line and the reference line. Additionally a label with the bearing from the aircraft to the navaid in degrees is drawn. Show Angle Forward of Point: determines if the angle displayed between the reference line and the second line is drawn before or after the point that they intersect. 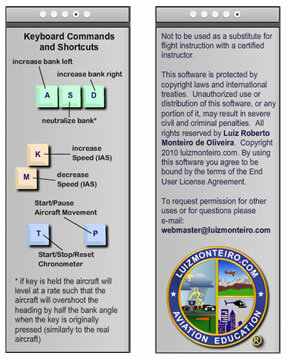 Shows the keyboard keys to control aircraft and other shortcut keys. CAUTION: The behavior of the instruments and other information displayed is approximate for illustration purposes only and may not reflect the actual readings on real aircraft. All rights reserved to luizmonteiro.com.